NORTHERN Tablelands MP Adam Marshall recently announced a grant of $200,000 from the State Government to help Gwydir Shire Council construct the region’s very first all-abilities park, in Warialda. Mr Marshall said Council would contribute $240,000 to the ground-breaking project, which will see the creation of a welcoming and comfortable space for all ages and abilities, offering a range of physical activities and a variety of landscape settings. “There are play spaces already in Warialda and other communities in our region, however, by design, they do not cater for everyone,” Mr Marshall said. 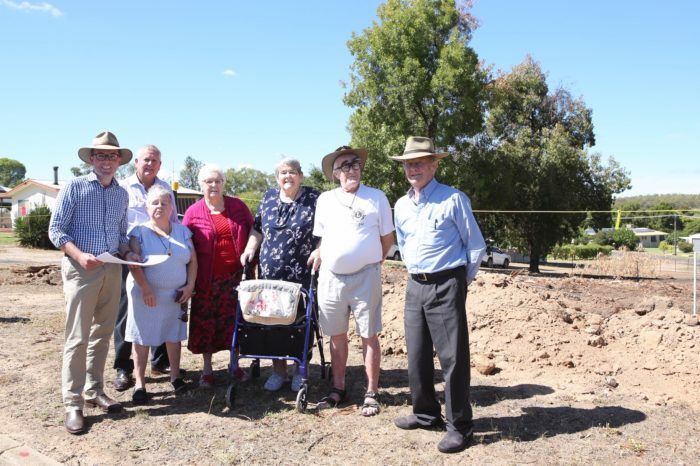 Northern Tablelands MP Adam Marshall, left, Gwydir Shire Mayor John Coulton and Naroo Aged Care Hostel residents, Julie Selby, Jean Williams, Joyce Mclymont, Brian Staunton and Doug Wilson in front of where the new all-abilities park will be constructed. Mr Marshall said the site for the park had been carefully chosen by council, adjacent to the Warialda MPS and Naroo Aged Care Hostel. “This will give locals and visitors easy access to a range of play and exercise equipment and great opportunities to connect with others,” he said. Mr Marshall said the idea behind the government’s Everyone Can Play program was to give councils the opportunity to create parks that are easy to access, easy to move around in, provide a range of play types and challenges, and are equipped with appropriate facilities, in a comfortable environment. “This is a fantastic boost for local families as it will support the kind of open spaces the local community wants and needs – places that are accessible to all, places that help keep us connected,” Mr Marshall said. Mr Marshall expects that the park will also help attract many more tourist to stop off in Warialda during their journey as there will be no park like this anywhere in the region. Gwydir Shire Council has started construction work on the park and expect to have it completed late this year.